Celebrating Women of Pinot at Ponzi! 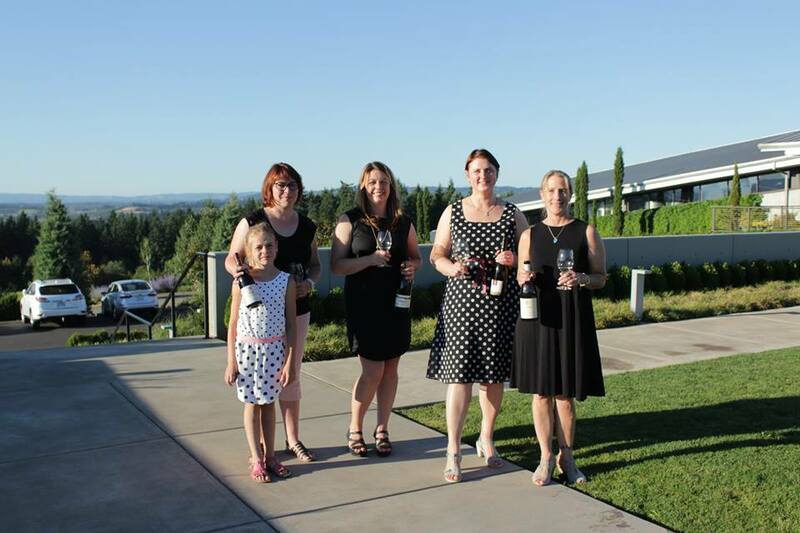 Ponzi Vineyard’s second generation sisters, Maria and Luisa Ponzi welcomed Lucie Lawerence of New Zealand’s Aurum Wines, Julie Cooper of California’s DuMOL Winery and Ludivine Ambroise of Burgundy’s Maison Ambroise for a magical evening celebrating these four women winemakers of Pinot noir. Ponzi Vineyards Culinary Director Tom Ghinazzi’s fresh, summer-inspired menu complemented each wine expertly, combining stunning vintages with delicious food for a truly remarkable dinner. Courses included a Foie Gras with raspberry, frisee and apricot, wild salmon garnished with hazelnuts and thyme, and a chateaubriand of prime beef topped with bordelaise, lavender and chanterelles. Stories from the winemakers regarding their experience in the field and individual philosophies offered further insight into the secrets and complexities of the industry. Finally, as the evening wound down, guests enjoyed Ponzi Vineyard’s stunning views of a pastel sunset over the Chahelem Mountains. The new hospitality space begins to take shape at the Ponzi Vineyards Winery. A towering fireplace and feature walls are poured from concrete, reflecting the look and feel of the winery’s modern tasting room. Designed by Portland-based Fogelstrom Design Build, the addition will accommodate up to 80 guests and can be partitioned off for more intimate tastings and receptions. The fireplace anchors the main room, but the real architectural showpiece is an arched wood ceiling that emulates the curve of a wine barrel, bringing both a sense of spaciousness and warmth to the space. Large sliding glass doors open to a private, wrap-around covered terrace, featuring an outdoor fireplace and sweeping wine country views. The new building, set to open Spring 2018, will provide a functional and elegant space for the winery to enhance the current hospitality program, further promoting world class, cool climate varietals, wine country tourism and culinary arts. PV: Do you enjoy wine? If so, what do you fill your glass with in the summer? PV: What are some of the benefits you see to taking your yoga practice outside? PV: What are some tips for anyone new to yoga, maybe trying their first class? Join us Saturday, July 22nd at 10am for Yoga in the Vineyard.